Active education and awareness program? Uses a risk register to track “risks”? Jack next revealed some of the results from the FAIR Institute’s 2018 Risk Management Maturity Benchmark Survey, based on a detailed questionnaire filled out anonymously by CISOs and other security managers, data used to score each organization on a scale of maturity (in other words, how well they "make well informed decisions" and "execute reliably" based on, for instance, use of risk terminology or a risk model). The bottom line: the surveyed companies were still at a low level of maturity though up from last year. "Our new frontier is risk management maturity," Jack said. Jack suggested taking a page from the research into human thought processes by psychologist and Nobel Prize winner Daniel Kahneman, author of Thinking Fast and Slow. Kahneman writes about System 1 thinking, fast and reflexive, vs. System 2 thinking, slower and orderly. He challenged the conference audience to consider which system they’re relying on when they, for instance, rate audit and security findings High/Medium/Low or rely for guidance on common maturity models like NIST CSF. System 1 thinking isn’t necessarily bad, he said, but it does need to be calibrated. 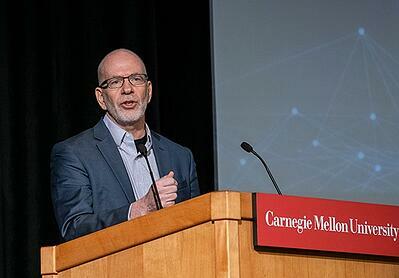 “We’re beginning to make great progress on the risk measurement frontier,” Jack said but “we have to open a second frontier to change views of what ‘mature’ means”, particularly working to show organizations the limitations of System 1 thinking applied to risk.